One of my most popular posts on Akit's Complaint Department is from September 28, 2008 when I mentioned my regular Costco location at El Camino Real in South San Francisco eliminated executive/business hours. Not long after that blog post and some heat on Yelp, the executive/business hours was back on the board. It's 2011 and it happened again. 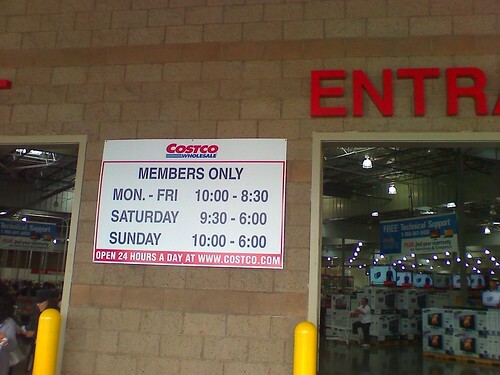 The photo above shows Costco El Camino's new hours for weekdays, now open to all member levels at 10AM, instead of Executive/Business at 10AM and Gold Star at 11AM. It's a little strange they wiped off the other operating hours, such as optical, pharmacy, and all holidays. Below is what the old board used to say. The early member hours was one of the big benefits to those who held an Executive or Business membership because everyone was able to get into Costco one hour earlier than the Gold Star members, and that meant less crowds inside the warehouse and shorter lines for check-out. When I was working part-time, I'd go to Costco at 10AM and was able to get out the door in less than 20 minutes. This member hour benefit also helped the business members because they can grab everything before the crowds show up, and especially when rolling a flatbed in Costco, you don't want to break someone's ankle. As of today, Costco's website for that particular warehouse still mentions executive/business hours is still from 10-11AM while the photo shows it not correct. I feel they eliminated the special hour, but with such huge omissions on their new sign in the other stuff like holiday closures, their other services (gas, pharmacy, etc. ), are they trying to tell people that the special hour is still enforced, but not in writing? If you love Costco's Executive & Business member early hour, call the El Camino Real location: (650) 757-3003 and demand to speak to a manager. Accidentally showed up before 10am to Costco here in Phoenix today. Doors were wide open and I got my shopping done and checked out at 10:05am. Unannounced early hour??? ?